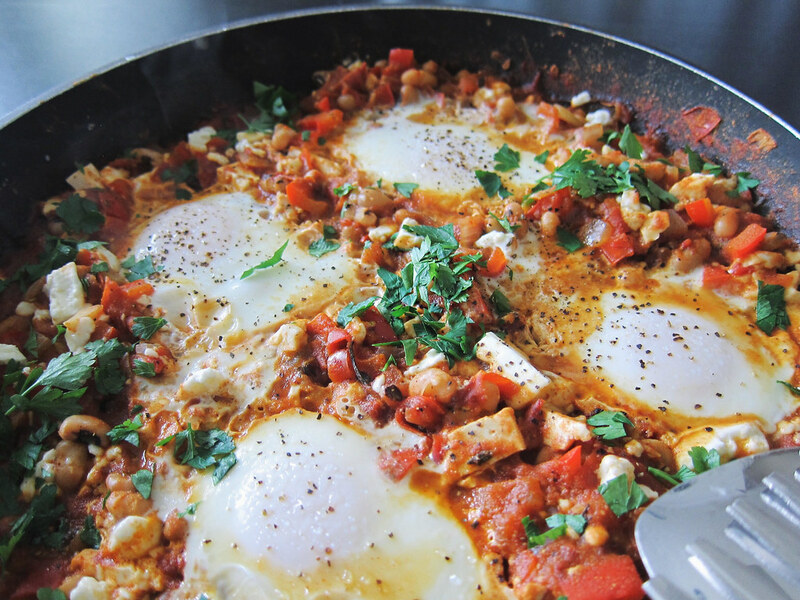 Shakshuka is a tomato & red pepper based Middle Eastern dish with poached eggs right into the sauce, traditionally served with pita or bread. 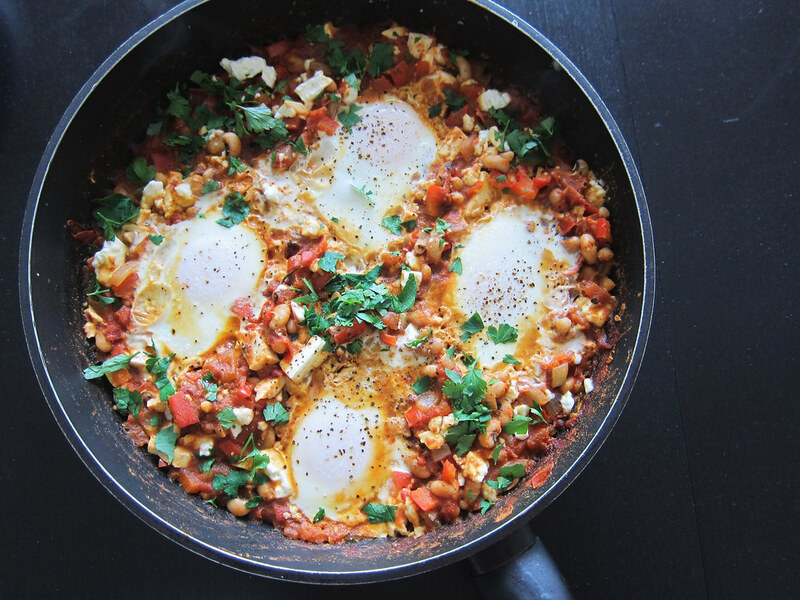 It is a one-skillet dish with tons of flavourful herbs & spices. 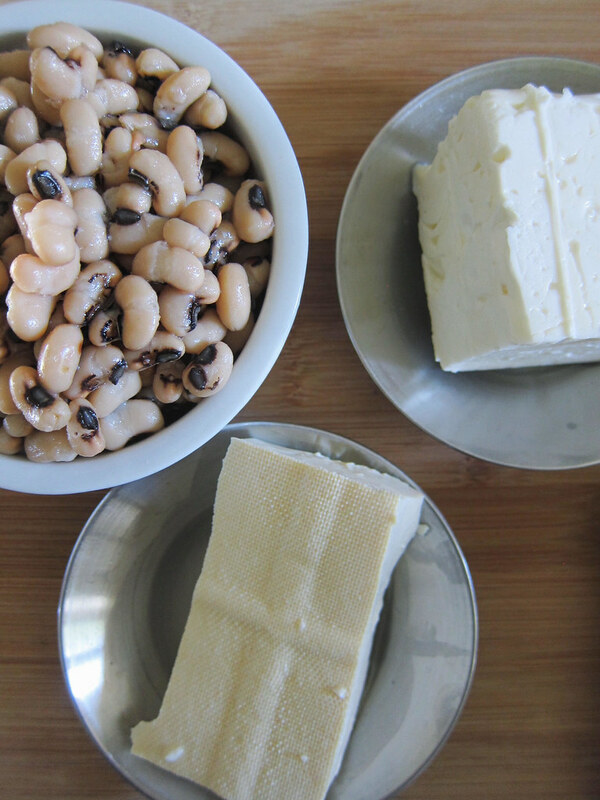 My twist on a classic recipe is the addition of some leftover tofu & beans for some added heartiness. 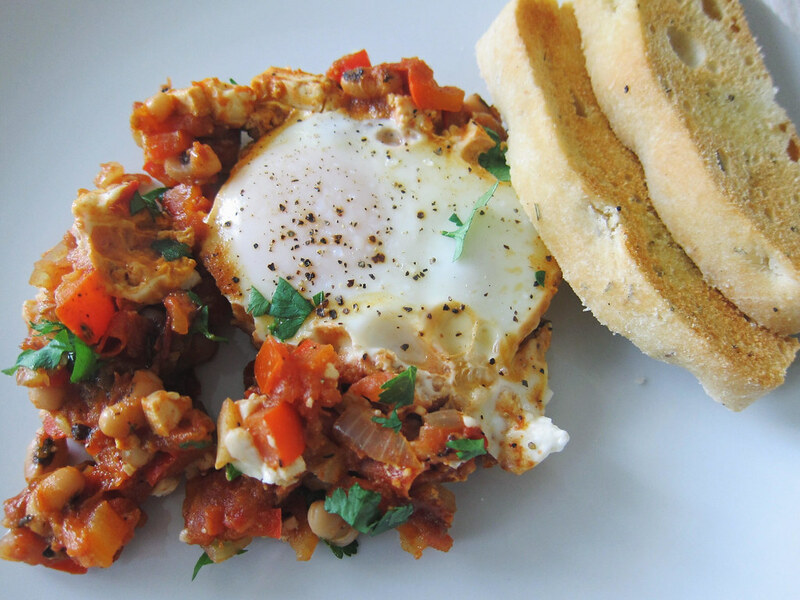 You can add any additional items to this base such as breakfast meats, mushrooms, or even harissa paste for a burst of flavour. NOTE: Recipe shown with additional ingredients added. 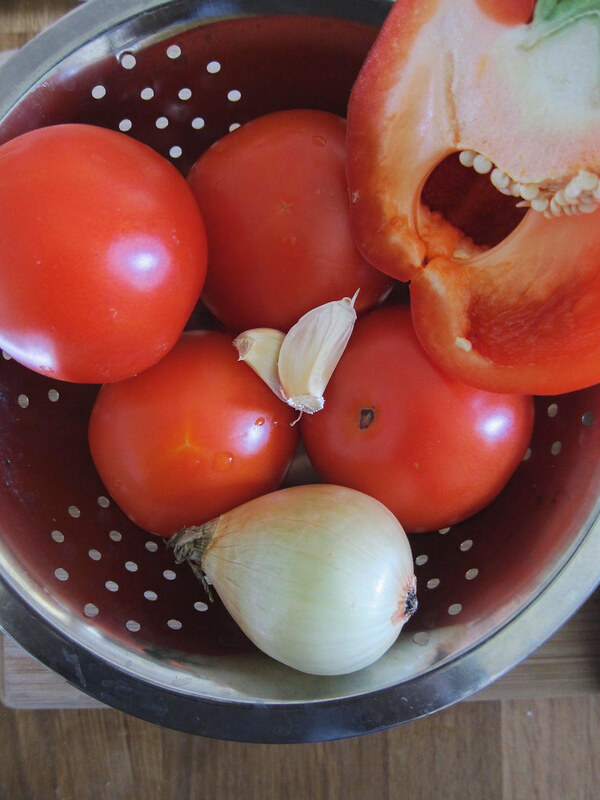 Chop your tomatoes into tiny pieces. 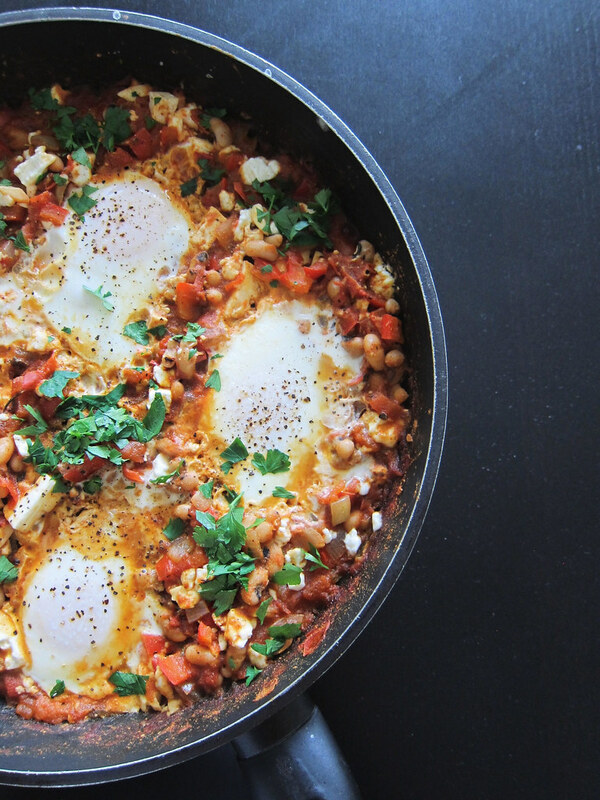 Heat your skillet on high, add olive oil & chopped tomatoes so they begin to break down. Mince garlic, chop onions, & bell peppers. 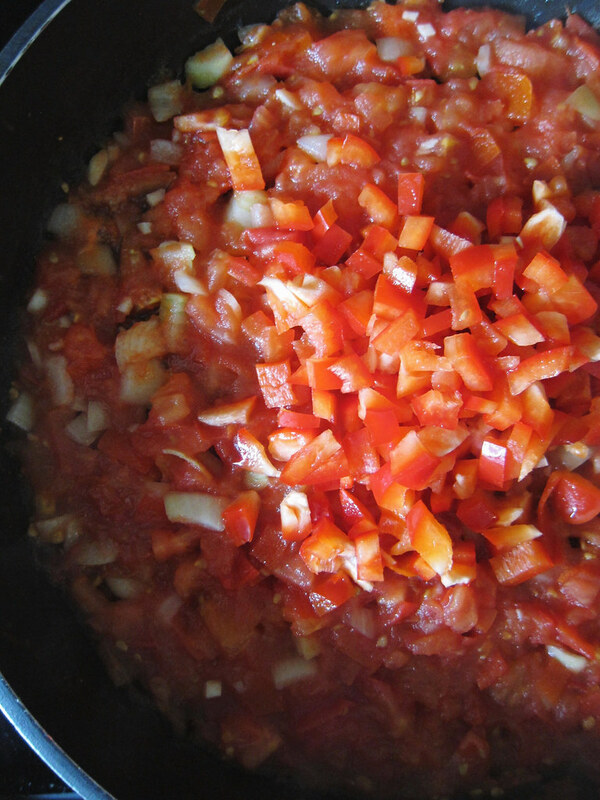 Add your garlic & onions to the pot, mix, let the sauce simmer then add chopped bell peppers. 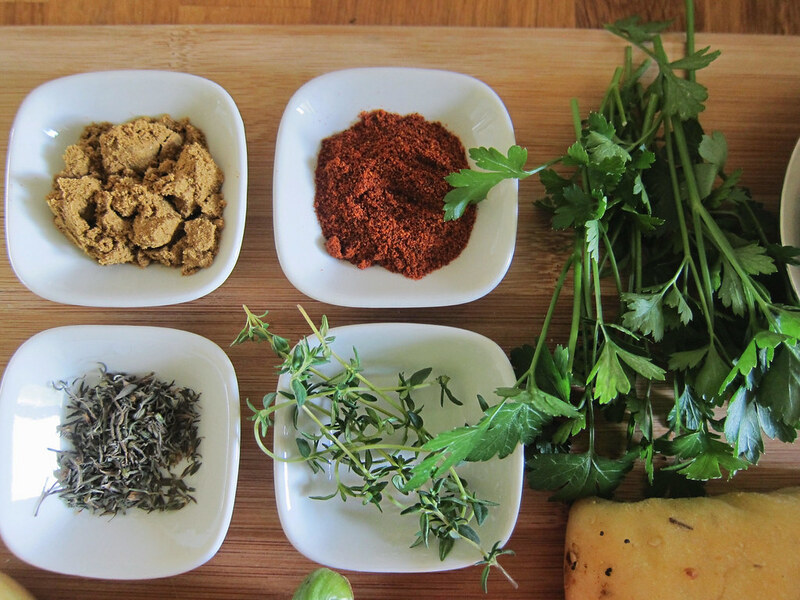 You add each ingredient one at a time to build flavours into the dish. Reduce heat to medium. 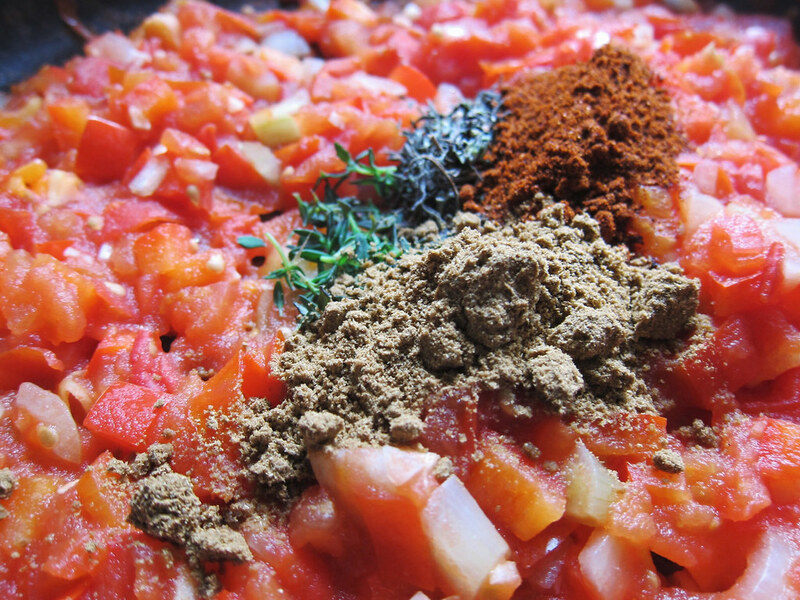 Add brown sugar, ground cumin, smoked paprika, fresh & dried thyme leaves to your skillet. Add 1/4 cup water to deglaze the pan. 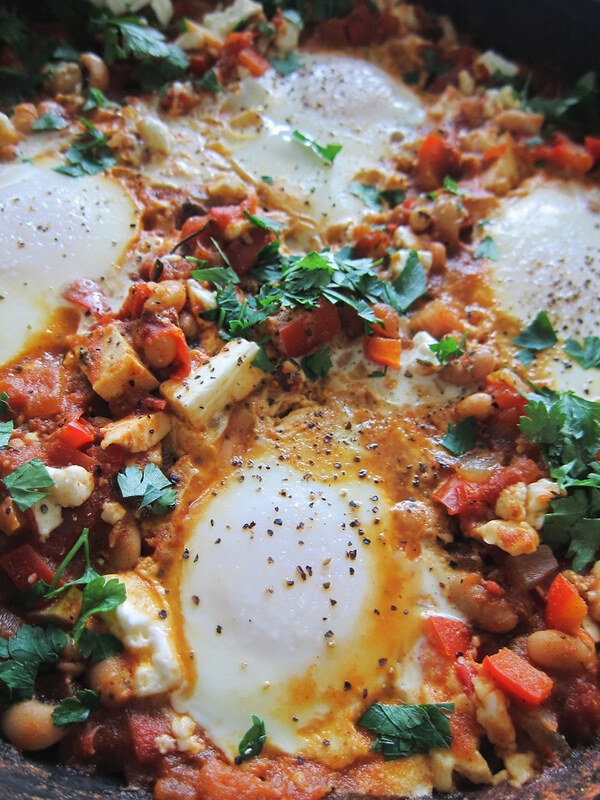 Add chopped tofu & beans to your Shakshouka. Let the sauce continue to simmer. 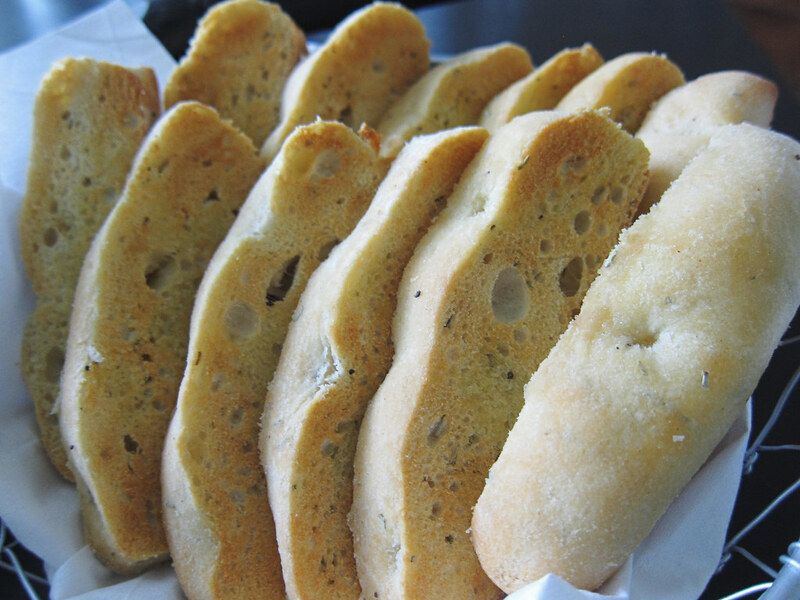 Meanwhile, slice & slightly toast your bread with some extra virgin olive oil. 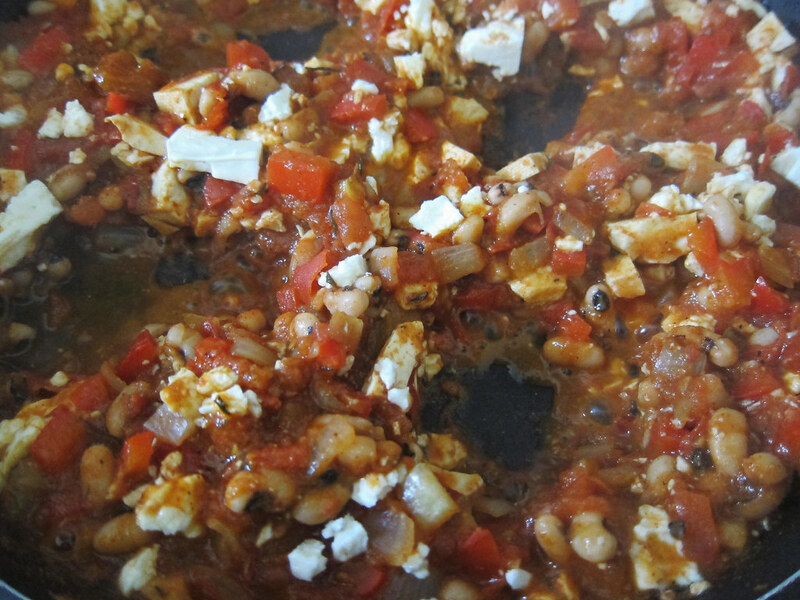 Mix the sauce one last time then add crumbles of feta. Do not mix again. 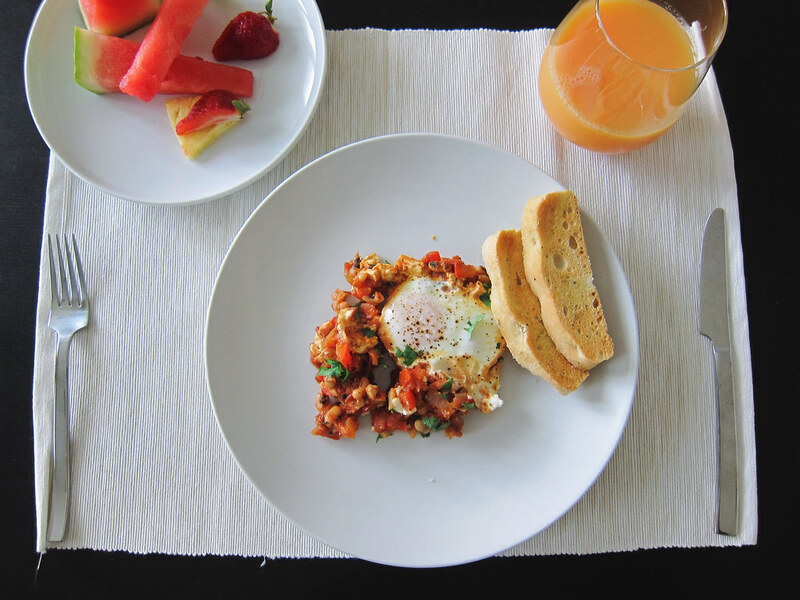 Create 4 wells into your sauce for the eggs. 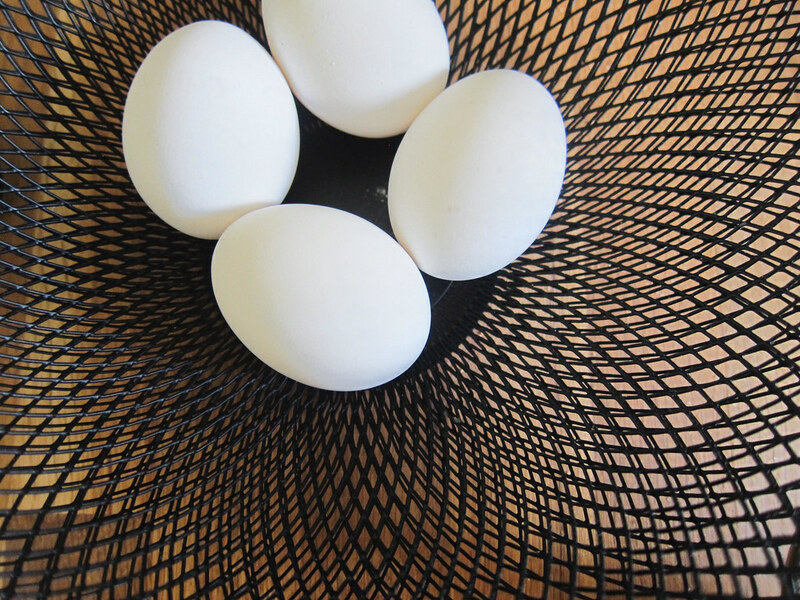 Tip: I always crack my eggs into a bowl then add it to any dish to avoid cracking shells into the pot or pan. 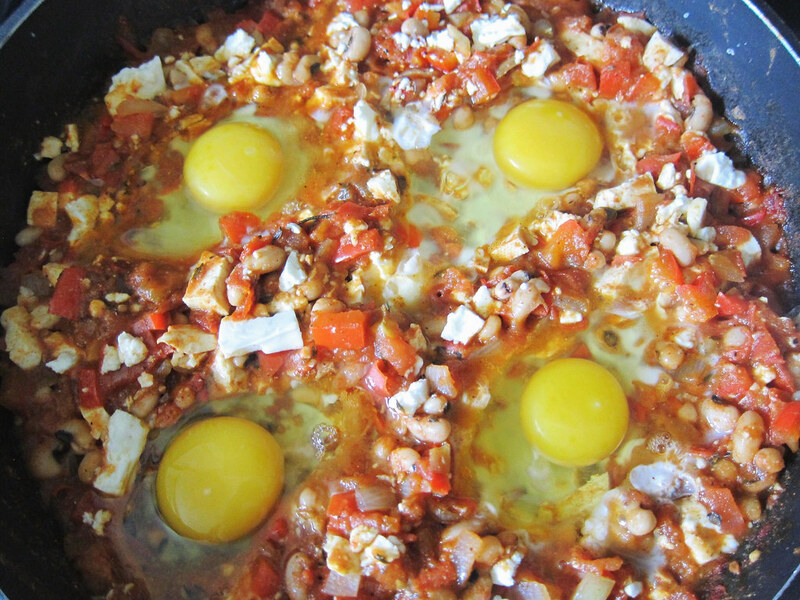 Add eggs into the wells & cover skillet. Reduce heat to low. The steam will slowly poach the eggs to over easy; keep a runny yolk. 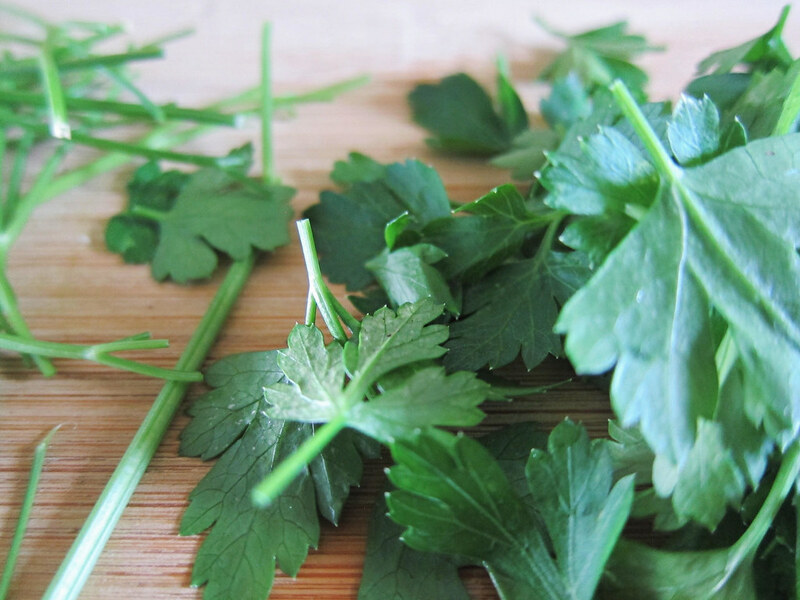 Garnish with chopped parsley, sea salt & black pepper. 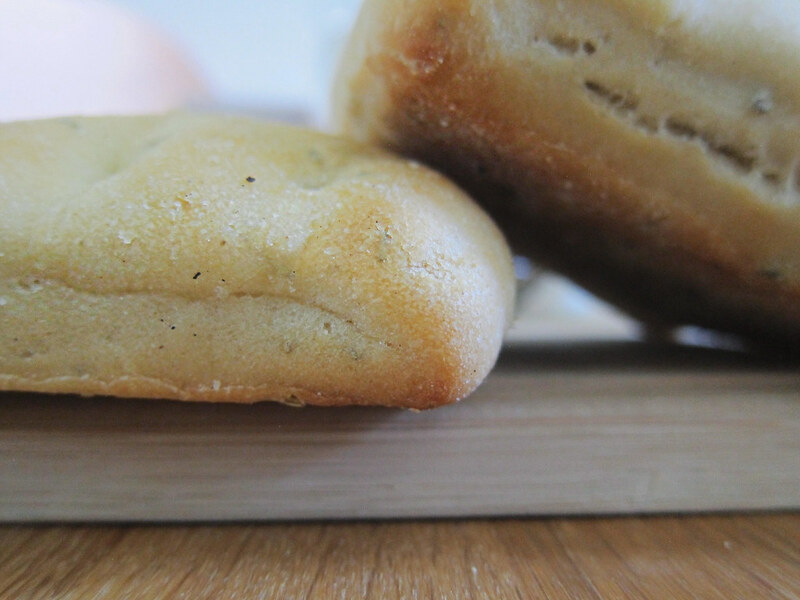 Serve immediately with warm bread; serves up to 4.